The V&A is the world’s leading design museum and the BCA is the black history centre for the UK. So the exhibitions reflect the missions. 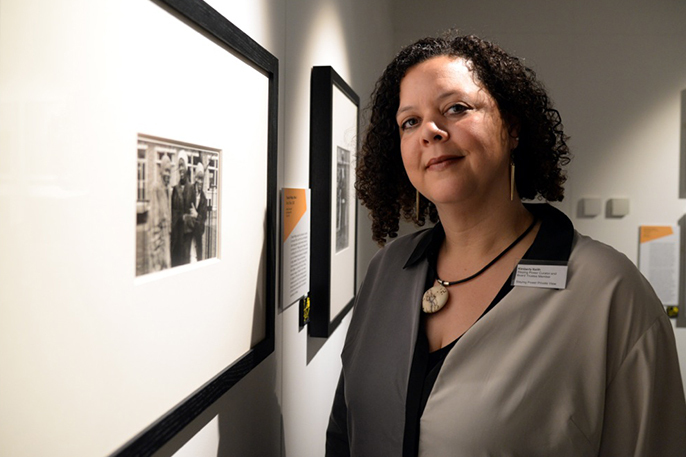 Since its grand opening in July, the Black Cultural Archives (BCA) has had more than 20, 000 visitors cross its threshold. The new centre for exploring our nation’s multicultural history has started its new journey with a considerable Brixton bang. Alongside its range of programmes and workshops the BCA also offers two permanent exhibitions per year in its gallery space. 2015’s exciting new exhibit Staying Power is a collection of photographs which document the black British experience from the 1950s to 1990s. The exhibition’s curator Dr Kimberly F Keith explains that she wanted to make the exhibition as interactive as possible, implementing oral testimonies from the photographers accessed via a headset. Jennie Baptiste is a Londoner of St. Lucian descent and her work, inspired by youth culture and music, was included in the exhibition Black British Style at the V&A in 2005. 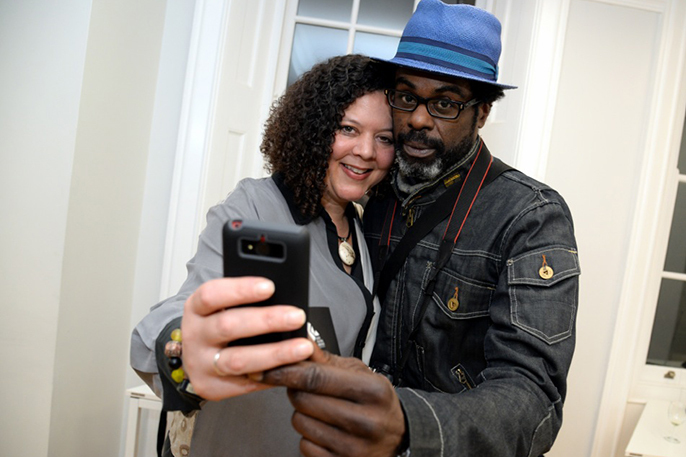 She has photographed many musicians in London and New York, mainly rappers, hip-hop, and R&B performers, as well as documenting the dancehall scene and the Maroon community in Jamaica. Pinky is a Dance Hall Queen who lives in Brixton and is well known within the community for her appearance – she is always coiffed and adorned in pink from head to toe. A lovely aspect of this exhibition is the display case cabinets which, have drawers the visitors are encouraged to open to reveal more archival treasures. Having over 15 years of experience working in museums including the Museum of Glass in Seattle, Dr Keith has used her expertise to create a highly versatile gallery space in which panels can be removed to modify the light. Speaking to the Goldsmith’s graduate, the amount of dedication to the Staying Power project is rather inspiring. As I’m shown around the fascinating collection of cameras, publications and photographs I am curious to know what inspired this exhibition, what makes it significant and if Dr Keith herself has a favourite photo. Staying Power is a collection of photographs that depict the black British experience in the latter half of the 20th century. The images that are displayed here all have a particular significance and a story to tell. The project started in 2008 and it’s a collaborative partnership between the Black Cultural Archives and the Victoria and Albert Museum (V&A). The partnership is centred around acquiring photographs to put into the permanent photography collection at the V&A. Additionally, we collected oral history testimonies from the photographers and from some of the subjects in the photographs. We’re doing various programmes such as family and school programmes, some of which will be here and some at the V&A. Our exhibit will run January 15 to June 30 and at the V&A it will go from February 16th to May 24th. So they’ll overlap and we’ll have a conference on the 21 and 22 of May. Were there ever any professional squabbles about who exhibited particular images? It’s all photographs of the black British experience so they all relate to an aspect of blackness and Britishness. How did you choose the final images out of the 118? We did that as a team and it involved months long discussions. So the Staying Power project team selected the photographers and the images that were collected. As the curator I made the final decision and chose these 24 images to go in this space and arranged the exhibit and the archive material the way I thought it would be most effective. Just picking one is tough. Sid Sheldon’s Specials’ Fans is one of my favourites, because I love the Specials. In fact (shows me to one of the gallery’s three display cases) this is one of my albums and these are some of my badges from when I was a teenager. Actually this is Sid Sheldon’s camera that he took that particular photo with. He was the official photographer for Rock against Racism, which was a series of concerts organised by political activists and musicians in the 1970s. I love it all for lots of different reasons. James Barnor’s Mike Eghan at Piccadilly Circus is just a wonderful image. Charlie Phillips’ Flat to Let says so much about the colour bar and the conditions that black people were living in in the fifties and sixties. Each photograph tells a story. 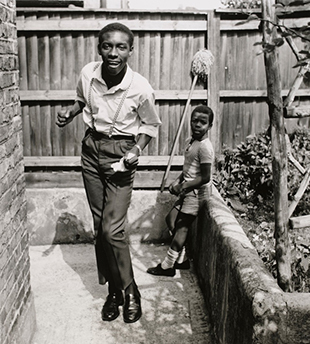 The subtitle of the exhibition is Photographs of Black British Experience, 1950s-1990s. Why was pre-millennia chosen as the cut-off point? Because the project is funded by the Heritage Lottery Fund and for something to be considered heritage it has to be at least ten years old. So these are all from the second half of the 20th century, which was a hugely formative time span. Is there a common theme, which links all of these images? The common link is in the title. It’s all photographs of the black British experience so they all relate to an aspect of blackness and Britishness. That’s either in both aspects of representation of the photographer taking the picture, so 14 of the 17 photographers are people of African or Caribbean descent, and also the subject matter of the photos. We refer to out collection as spanning themes from protest to progress. So yes, you have examples of overt racism such as Neil Kenlock’s Keep Britain White. You have protest against that, such as the photos of the Handsworth Riots. But then you have evidence of progress; people being part of the community whether that is through music which is shown in Dennis Morris’ work, or through fashion or all these different aspects of community. It’s expansive and it relates to the archives collection. It’s encouraging a dialogue between the photographs and the archive material and encouraging people to learn more about different aspects of black British history. Having worked at museums in both the UK and the US, is there an obvious difference between the ways institutions work either side of the Atlantic? The most obvious difference is the fee-based entry. We have the Smithsonian, which is the national museum of the States which is free. Where I live in Seattle there’s one free museum which is the Frye Art Museum, but most museums will cost anywhere between ten and 20 bucks entry. There are discounted rates for school groups, but in terms of individuals and families who do that for their leisure time the biggest difference is the price. That can definitely discourage people, and the lack of availability depending on which state people live in. Neil Kenlock came to London in 1963 from Jamaica. He became the official photographer of the British Black Panthers and was a photojournalist for the West Indian World newspaper, which is where the image Untitled (Keep Britain White graffiti) was taken on assignment. 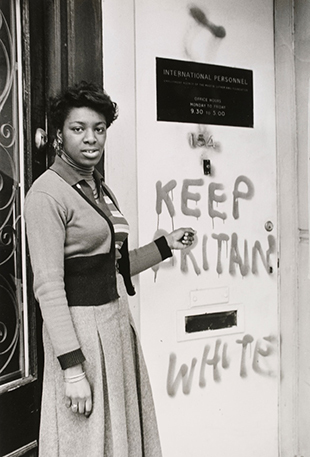 Kenlock asked Barbara Gray to pose in front of the door to the International Personnel Training Centre, which was an employment agency headed by David Udah, a key member of the British Black Panther movement. This racist attack was one of the many incidents that Kenlock captured in his determination to portray pride in the face of prejudice. Whilst in America you developed educational outreach programmes for young people. What did that involve? That started when I was at the Children’s Museum in Seattle and I developed arts and humanities programmes for kids with families living in public housing, mostly African immigrants. I ran those for about nine years, then at the Museum of Glass they’d heard about that work so they asked me to start the Remann Hall Project. There I worked with incarcerated female offenders doing arts and humanities programmes within the maximum-security detention centre. I had a team of a visual artist, a recording engineer and a poet and we all worked together with the young women to do a collaborative project. The first year it was a large sculpture that had an audio component, which you walked through with. The second year we make a book of poetry and an exhibition in the museum and the third year we built a website. It was a fantastic project; I loved it. I think people could do that kind of thing here, but it takes a lot of resources and someone dedicated to wanting to do it. I came here to do my PhD at Goldsmiths and that was where I found out about BCA and I started volunteering here. So the work I’ve done here is all as a volunteer and I’m also a trustee. All of the BCA is based on volunteer work, you can achieve anything if you have people that are passionate and dedicated. Why does the BCA make you passionate? Because it needs to be here. A mainstream institution can get away with a lot under the rubric of ‘widening audiences’ or ‘diversity.’ A lot of people use the word diversity in place of race or ethnicity. At the BCA you can’t avoid having a conversation about race because we are the Black Cultural Archives; it’s in our name. So just by virtue of existing we are encouraging people to have a dialogue about identity and belonging and Britishness. I’m a mixed race person and race isn’t contentious to me. I have a black parent and I have a white parent, I just get on with it. But for other people that’s an issue. When I see Charlie Phillips’ photo Flat to Rent, I remember stories my mum told me about how when she’d go to rent an apartment on her own it’d be fine but when she bought my dad along it would be “Oh, no it’s not available anymore.” So that is in my lifetime and those issues are part of the fabric of my life. I think it’s important to engage in dialogues about difference. I think looking at these photographs and contemplating issues of representation raises questions that are really useful to ask. Pull quote: The more we know about history the more we can better negotiate our present lives and stand ourselves in better stead for the future. Why should people come and see Staying Power? Because I think it’s important to engage in dialogues about difference. I think looking at these photographs and contemplating issues of representation raises questions that are really useful to ask. Black history is all of our history. So this exhibition is for everyone to come and learn about our history, because the more we know about history the more we can better negotiate our present lives and stand ourselves in better stead for the future.